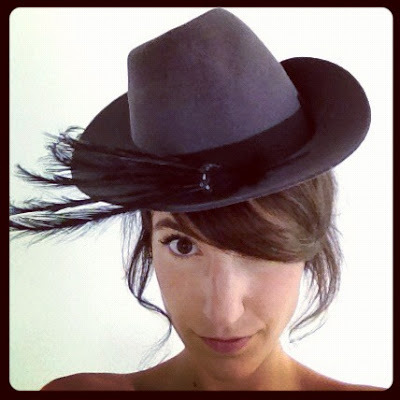 I spy with my little eye... a 1950's Vintage Hunting Hat. 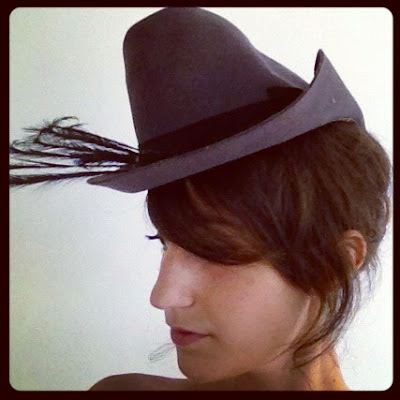 ... and talking about Vintage, remember that post, my surprising meeting with a talented Milliner on Brick Lane in London last Summer? Well, after spending a few hours chatting and trying all the Hats in his shop "This shop rocks", I finally bought two pieces. This 1950's Lady Hunting Hat, and an other completely different one I will show you later. For this one, he explained that the shape of the Hat should be in harmony with the shape of the face (nothing new here), which means that the line of the hat should continue the oval of the face. One can usually see what kind of Hat compliments one's Face, but it is not always easy to understand why. A big Thank You to that amazing Milliner for the unforgettable time I had with him.